Woodbury University is a private, non-profit, coeducational, nonsectarian university located in Burbank with and a satellite campus in San Diego, both in Southern California. Advertisement in the first year of the school's existence, 1884. 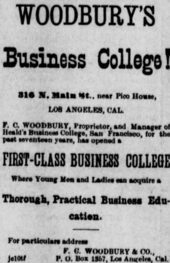 The school was founded in 1884 as Woodbury's Business College by its namesake, F. C. Woodbury, formerly a partner in Heald's Business College in San Francisco, thus making it the second oldest institution of higher learning in Los Angeles and one of the oldest business schools west of Chicago. That historic link between Woodbury and the world of business has been maintained throughout the years. Woodbury was coeducational from its founding, making it one of the earliest colleges West of the Mississippi to admit women. 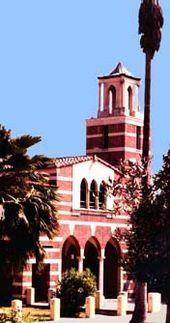 The original mission of Woodbury University was to educate Los Angeles residents in the practical areas of business: bookkeeping, commercial law, and telegraphy. For a time, Woodbury could boast that 10% of Los Angeles' citizenry were attending the institution and its earliest alumni lists form a who's who of 19th century Los Angeles. In 1931, the division of professional arts was established to focus on those fields of design that are closely allied to business: commercial art, interior design, and fashion design. Woodbury then became a college of business administration and design. In 1969, Woodbury introduced a graduate program leading to the Master of Business Administration (MBA) degree. In 1974, Woodbury College became Woodbury University. In 1982, Computer Information Systems was added as a major, followed in 1984 by Architecture. In 1987, the Weekend College program for working adults was established with the aid of grants from The Fletcher Jones Foundation and The William Randolph Hearst Foundation. In 1994 the university formally organized its undergraduate and graduate programs into three schools: the School of Architecture and Design, the School of Arts and Sciences, and the School of Business and Management. That year three majors in the School of Arts and Sciences came into being: Psychology, Politics & History and Liberal Arts & Business. Additional undergraduate degree programs have been added in the areas of Marketing, Animation Arts, Communication, and Leadership. The Los Angeles Times Library at Woodbury University, formerly the Villa Cabrini Academy chapel. For the first 103 years, the university followed the growth of the business community based in Central Los Angeles. It was originally at 226 South Spring Street in Downtown Los Angeles. By 1937, it moved to new facilities at 1027 Wilshire Boulevard in the Westlake district, just west of downtown. For 50 years this building served the university’s classrooms and administrative needs. In 1985, the university acquired a 22.4-acre (9.1 ha) suburban campus in Burbank, the site of the former Villa Cabrini Academy, a high school for girls run by the Missionary Sisters of the Sacred Heart, founded by Frances Xavier Cabrini. In 1987 the university moved to the new campus in the eastern San Fernando Valley. Since 2005, the Los Angeles campus has been home to the Julius Shulman Institute. In 1998 the institution opened a satellite campus in Downtown San Diego, Woodbury University San Diego, where it offers Bachelor of Architecture, Master of Architecture, and Master of Interior Architecture degrees. In Fall of 2008, It moved from Downtown San Diego to the Barrio Logan neighborhood . The new location's building features a computer laboratory, studios, classrooms, and a library. The university has a gallery in Hollywood, CA known as WUHO which houses experimental exhibitions and multi-disciplinary collaborations. Currently Woodbury University comprises three schools and one college offering graduate and undergraduate programs: The School of Business, School of Architecture, School of Media, Culture & Design, and the College of Liberal Arts. Woodbury undergraduate programs admit students on a rolling basis and the acceptance rate for all undergraduate majors is 56.6%. Master of Landscape Architecture (M.LA), San Diego. Master of Interior Architecture (M.I.A. ), Burbank, San Diego. Woodbury's BArch and MArch programs participate in the National Council of Architectural Registration Board’s (NCARB) Integrated Path to Architectural Licensure (IPAL) initiative. NCARB has accepted 26 programs at 21 colleges to participate in the IPAL initiative. The program streamlines the professional licensure process, providing students the opportunity to complete requirements for licensure while earning their degree. Woodbury University is accredited by the Senior Commission of the Western Association of Schools and Colleges (WASC) and is approved by the Postsecondary Commission, California Department of Education. The Western Association of Schools and Colleges granted Woodbury its original regional accreditation in 1961. In 1994 the Architecture program was accredited by the National Architectural Accrediting Board (NAAB). In 1991, the Interior Architecture Program was accredited by the Council for Interior Design Accreditation. In 2008, the school received accreditation from the National Association of Schools of Art and Design (NASAD). Woodbury is a member university of the Association to Advance Collegiate Schools of Business (AACSB). The School of Business received its accreditation from the Association of Collegiate Business Schools and Programs (ACBSP) Spring 1998. On May 10, 2014, Woodbury University announced that its School of Business is among 12 international and four American business schools to earn accreditation from AACSB International for 2014, joining 713 institutions of higher learning in 47 countries and territories around the world who have successfully completed the multi-year internal review, evaluation and improvement process. AACSB accreditation represents the highest achievement for an educational institution that awards business degrees, a status conferred on less than 5 percent of all business programs worldwide. Woodbury's Burbank campus has two residence halls with space for approximately 225 residents. South Hall, which is a small building composed mostly of single rooms, was built in the 1960s and houses up to 67 residents. South Hall is one of the original buildings acquired with the Burbank campus and was used as a dormitory for the Villa Cabrini Academy. North Hall, the larger of the two residence halls, opened in 1990 and houses up to 158 residents. Woodbury ranked 34 overall (and eighth among California institutions) in The Economist's first-ever college rankings published in October 2015. Woodbury currently ranks 10th among the 161 ranked colleges and universities in California in the 2017 New York Times "Overall mobility index" which reflects both access and outcomes, representing the likelihood that a student at Woodbury moved up two or more income quintiles. Woodbury ranks first among western regional universities in the percentage of international students (24%) in the 2018 U.S. News and World Report College Rankings. Woodbury has been chosen as a 'College of Distinction" from 2015 - 2018. In 2012, the wife of Woodbury University's then president, Luis Calingo, came under allegations over mistreatment of maintenance workers employed at the school. When the wife of the former president, Rose Nielsen, stood up for those workers and reported the alleged incidents to the university's human resources department headed by Natalie Avalos in August 2012, Nielsen was fired from the university without reason in September 2012 and was told Calingo would not meet with her. Nielsen then filed a lawsuit which the university declined to comment on, only saying that the university would "vigorously defend its actions through the litigation process". Other school executives at the time of the alleged incident included vice-president, Phyllis Cremer. However, in 2014, the university did not defend its actions but rather chose to silence the case and settle out of court withholding the details of the settlement with confidentiality agreements. Helen Gurley Brown – Author, publisher, and businesswoman. She was editor-in-chief of Cosmopolitan magazine for 32 years. Don Adolfo Camarillo – Land owner, horse breeder. ^ Thomas, Grace Powers (1898). Where to educate, 1898–1899. A guide to the best private schools, higher institutions of learning, etc., in the United States. Boston: Brown and Company. p. 12. Retrieved August 17, 2012. ^ "Villa Cabrini". The Museum of the San Fernando Valley. ^ "Stained-Glass Windows". Mother Cabrini Shrine. ^ LA Times.com: "Woodbury University Moving to Burbank", (18 Sept. 1985). ^ "WUHO Gallery - Woodbury". Woodbury. Retrieved 2018-02-26. ^ "IPAL Programs". NCARB - National Council of Architectural Registration Boards. 2017-02-27. Retrieved 2018-01-11. ^ "Integrated Path to Architectural Licensure (IPAL) initiative" (PDF). ^ LA Times.com: "Woodbury University, New Dorms to Finally Be Completed", (21 April 1990). ^ "Our first-ever college rankings". The Economist. Retrieved 2018-01-10. ^ "Economic diversity and student outcomes at Woodbury". The New York Times. 2017. ISSN 0362-4331. Retrieved 2018-01-10. ^ "US News and World Report College Rankings". ^ (www.thegkwco.com), theGKWco. "All Colleges of Distinction". Colleges of Distinction. Retrieved 2018-01-11. ^ US News & World Report: "Best Colleges: Woodbury University Rankings"
^ "Fired Woodbury University exec files lawsuit". ^ "Settlement reached in former Woodbury University employee case". ^ Scanlon, Jennifer (2009). Toff, Nancy (ed.). Bad Girls Go Everywhere: The Life of Helen Gurley Brown. Oxford University Press. p. 17. ISBN 978-0-19-534205-5. ^ "Angella Nazarian Graduation Speaker - Woodbury". Woodbury. 2017-04-06. Retrieved 2018-05-03. ^ "Eugene Blefari Named Graduation Speaker - Woodbury". Woodbury. 2016-03-17. Retrieved 2018-05-03. Facebook: Nan Rae Gallery — Burbank campus.